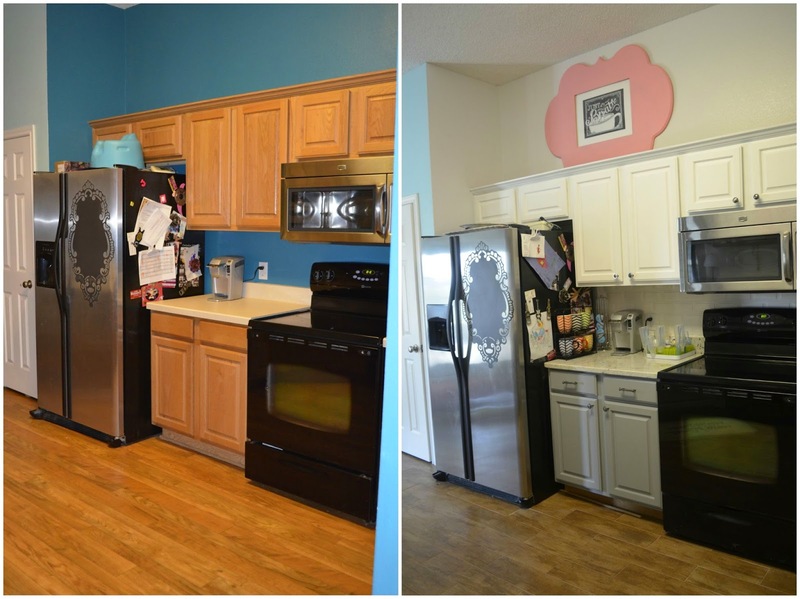 Skinny Meg: Kitchen Remodel - it's done! My kitchen is finally finally done and I couldn't be happier. It's very me, very bright, and exactly what I wanted. Let's start with a before. I always hated hated hated the builder grade cabinets, but at the time we chose something we could afford and later Oliver was very resistant to letting me paint them. Well, I finally broke him after I showed him some Pinterest pictures of what I wanted and he agreed. You can find my paint choices in this post. I really got lucky and they were spot on with my vision the first go round, it's pretty stressful to walk into Lowe's at 8 pm the night before they were painting and pick out colors. Grey's can be tough - not too light and not too dark. This one is perfect said Goldilocks. 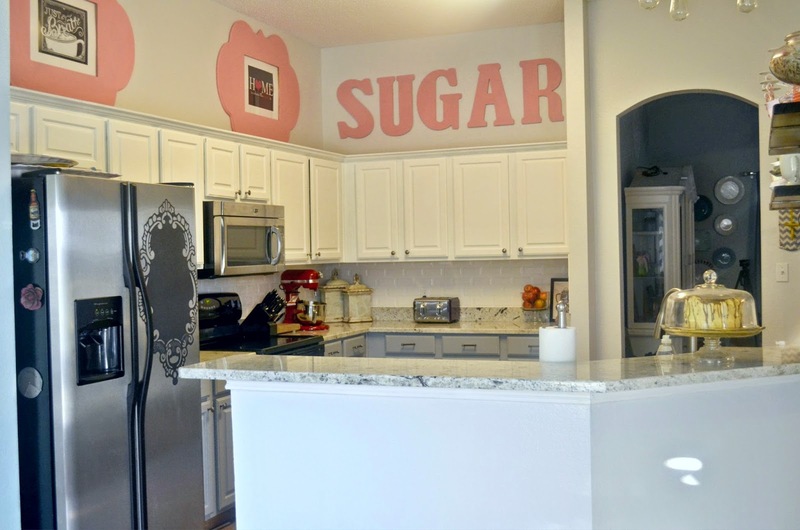 I kept my sugar sign, the letters are from Hobby Lobby, and we decided the kitchen felt a little 'cold' and needed a few pops of color. I just happened to have this perfect unopened can of pink paint, from Target, and it was exactly what I needed above the cabinets. So much open wall space drives my nutty. On the other wall I found some huge frames at Canton, similar here or here, and painted them to match. I framed some cute black and white prints I got off Etsy - here, here, and here. So for about 200 bucks I filled up a lot of empty space. Decorating above cabinets is tricky and I steered clear of knickknack - because dusting, ugh. Adding knobs was SUPER easy and fast, should of done that forever ago! I got these Allen and Roth Pewter knobs at Lowes and they are the perfect color on both the white and grey cabinets. I also splurged on a huge white granite sink - super deep and just lovely. I added a white subway back splash that is just gorgeous - it was very inexpensive too! On the side by the sink I decided to remove the cabinets above and replace them with open shelving. I searched Ikea and the home improvement stores and could find a dang thing I wanted - so I happened across this local company and took them a picture of what I wanted and they happily made me some. They are from Ross Rustic Tables in Rockwall, TX. I think they make the biggest impact in my kitchen, it just looks more custom and less standard builder grade stuff. Plus they were only about 100 bucks, winnnnnning. The next big item on my list is one of their tables - I'm leaning towards the Trestle Table with a long bench. My fridge chalkboard decal is available somewhere on Amazon, don't have time to search it out today for ya. The floors before were linoleum and the new one in tile - that looks like wood. 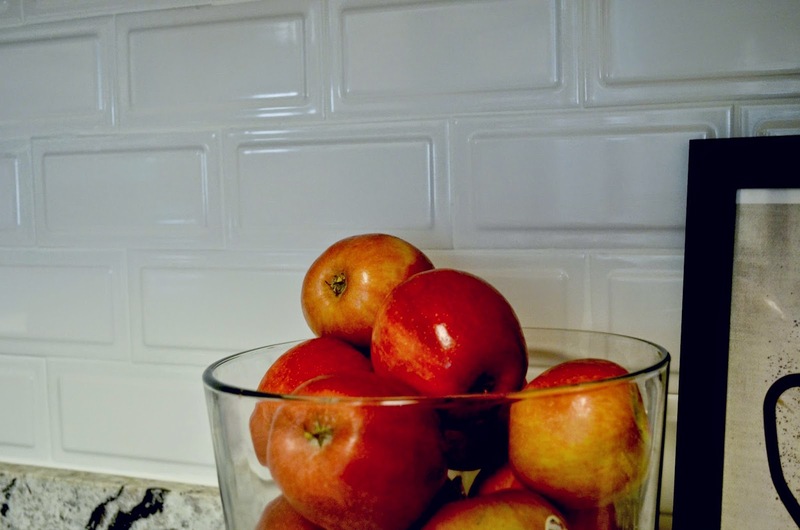 I'm VERY pleased with the tile - it's super durable, keeps the house cooler, and easy to clean. The brand is Interceramic Forestland Sequoia. The only thing left to do is to switch out the overhead lighting, right now it's one of those big ugly florescent lights. I'm concerned with adding a fixture that it won't be bright enough. If y'all have any suggestion please let me know! I'm soooooo jealous!!!!!!!!!!! I'm absolutely in love with the gray/white kitchen! I've been looking at similar ideas on pinterest, someday I will actually follow through! Nicely done! What is you took the fluorescent light out and replace it with 2 shabby chandeliers? I am not sure how tall your ceilings are so that may not work. They are pretty tall so I'd need some huge ones, but I like that idea! This looks amazing and just like that you've convinced me I need to do this to my kitchen. The hubby and I have been discussing painting our brown cabinets white (we just moved in and have literally only made about 3 mortgage payments so this will be in the future but eyeing yours up I know it's the right choice). Our walls are currently green (painted over dark red from previous owners to lighten it up) but after purchasing a gray couch, for our brown living room, we both think that gray looks bomb diggity with the brown so we might repaint the kitchen in months to come, THEN do the cabinets. Thanks for the link for the subway tile, We have been going back and forth because we don't want to keep our counters FOREVER, but we don't have $$ to change them right now... we are looking for something inexpensive incase we change it all later down the line, who wants to do expensive twice, right? Thanks for the inspiration. The kitchen is SO you! Love it! 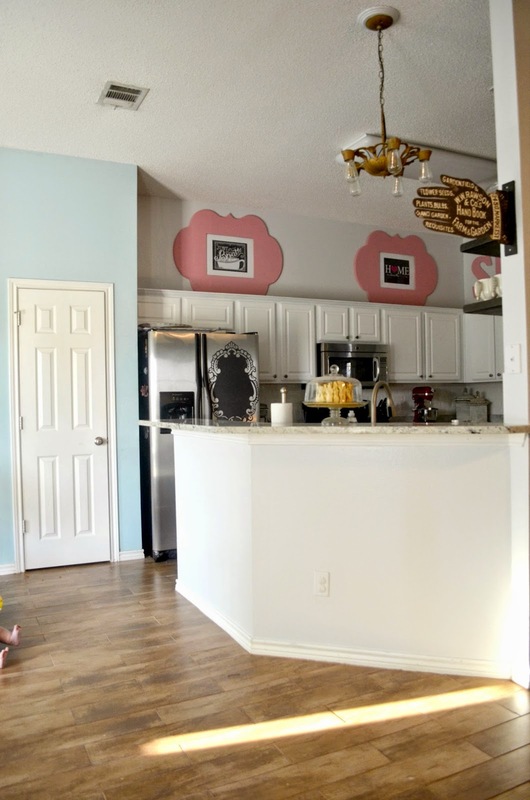 I so wish I had painted the cabinets forever ago - biggest impact for not a lot of money! Looks fabulous! I just have a question on the tile. Did you extend it into the living room? I would love to do this in my kitchen but I'm not sure if I would want it in the living room too. I guess with rugs though it would just be like having hard wood floors. Your kitchen layout is almost EXACTLY like mine. I absolutely love how yours turned out! Ever since you posted pic of the shelves on IG I've been trying to convince hubby to let us do the same. We are planning an update for next year. So jealous of yours, it's fabulous! The kitchen looks amazing, I love love love the white and grey!!! I love that Trestle Table, I want the Fancy Farmhouse and the Lemon Tree. Those are gorgous!!! That big sink is perfect too! I LOVE the open shelving. 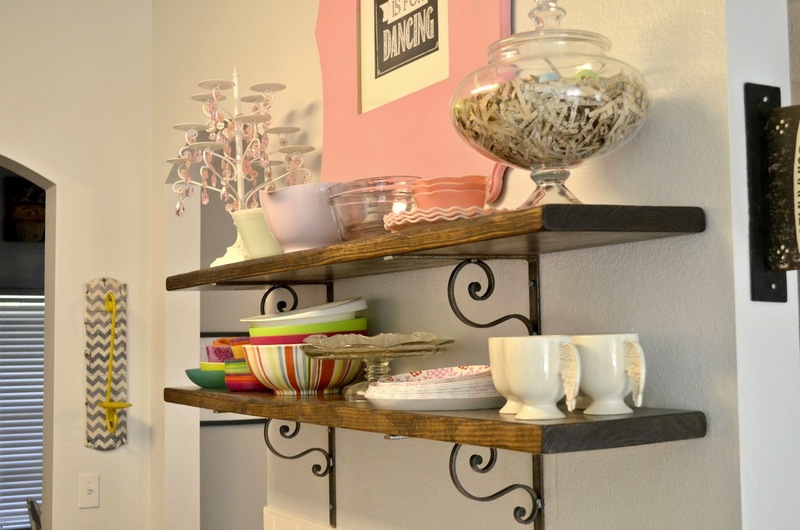 I want to do something like that when we remodel our OH-SO-80s (with melamine cabinets!) kitchen! I also like the light granite countertops. I am not a fan of dark ones. My friend has similar cabinets that you have but darker. I said don't you dare remove those, just paint them!! 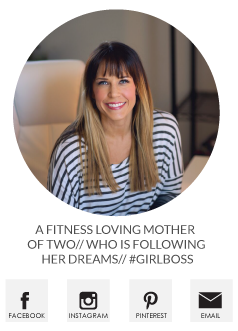 such a fun space and so you! I am working on updating my kitchen as well. We did a pottery barn knockoff chandelier (off amazon) over the island, with recessed lighting spread around the kitchen for when more light is necessary. I love it! Beautiful! And the change is so inspiring. You made such beautiful choices, and created a really gorgeous space. You must love walking in there! How does the hubs like it, after resisting initially? Looks good! 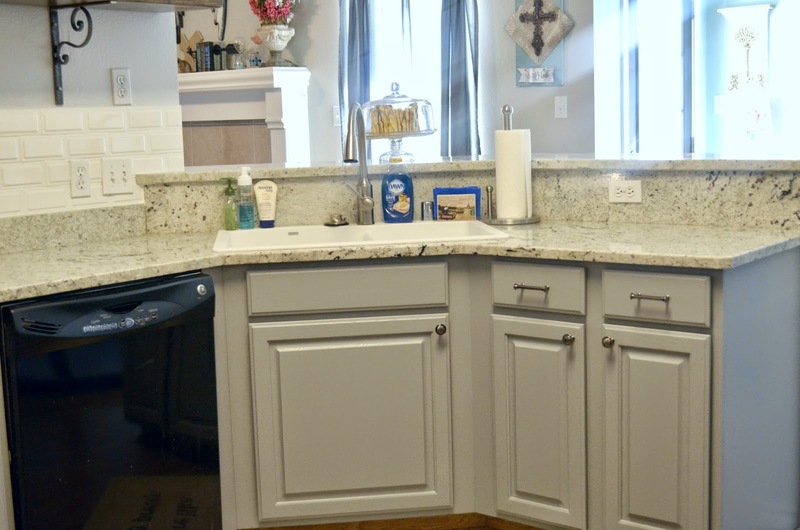 Love the different colors on the upper & lower cabinets! It turned out so great! Just like what I would love in a kitchen. 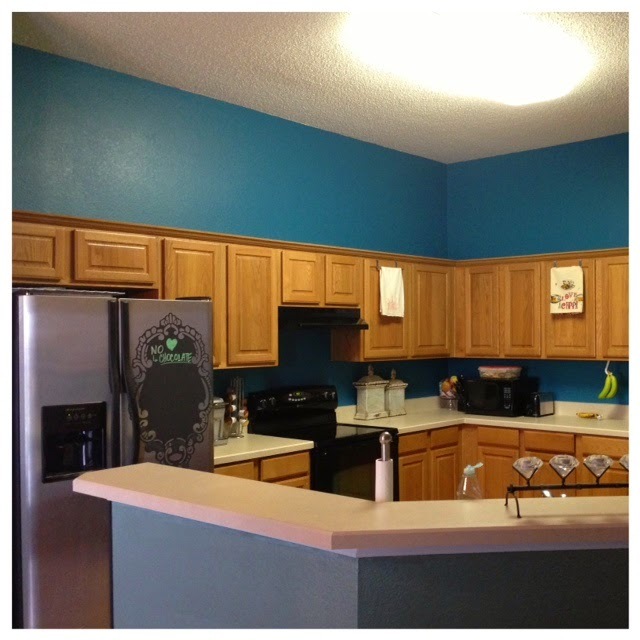 Question, did you end up painting the cabinets yourself or have someone do it for you? 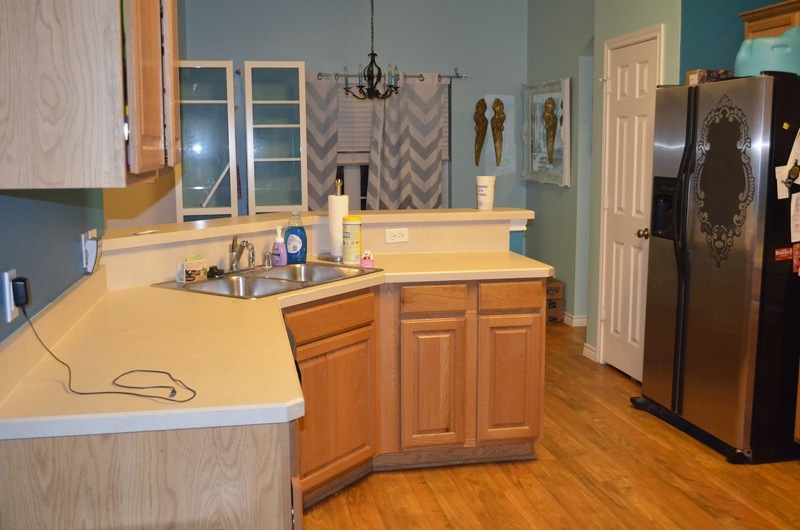 would LOVE to know what kind of paint you used for the cabinets! 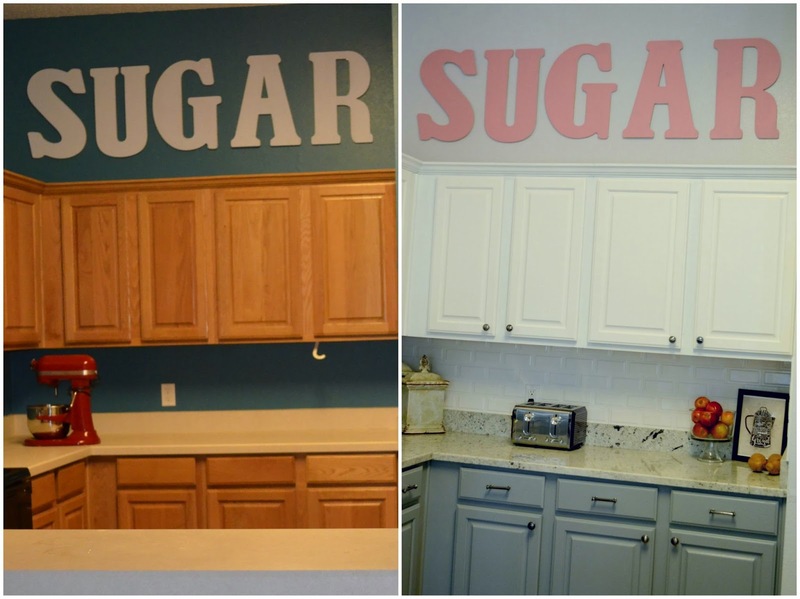 i want to do this to our kitchen too! Love it! How did you do those cabinets? Love your remodel! Makes me want my house even more thats being built right this second!! Looks fab! Your remodel looks awesome! We just redid our kitchen and family room. I had to talk my husband into painting the wood cabinets. He loves it now! In the kitchen we also had a florescent light fixture and popcorn ceiling. They smoothed the ceiling and did a low coffered ceiling with can lighting. We love it!